President Rob L. Manuel, left, with Pamela ’84 and Edwin Qualls ’84. 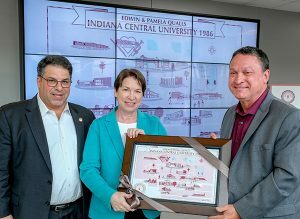 New video walls, made possible by a generous donation from Edwin ’84 and Pamela Qualls ’84, bring new technology to the University of Indianapolis Health Pavilion to showcase student and faculty achievements. The state-of-the-art monitors on display in the Health Pavilion atrium contribute to the dynamic ways the University is sharing information across campus. 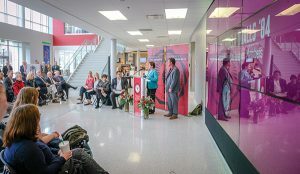 The video walls, which are powered through technology offered by Just Add Power, will be used to highlight student artwork, videos, notifications and emergency messages. Ed Qualls is president of Just Add Power, which specializes in video technology for distributing HDMI® over IP networks. President Robert L. Manuel said the Health Pavilion was the perfect representation of how learning experiences and spaces have evolved since the University’s inception in 1902. “Throughout the past nearly 120 years, spaces and modes of teaching and sharing information have changed and never with such speed as in the past 25 years,” Manuel said. 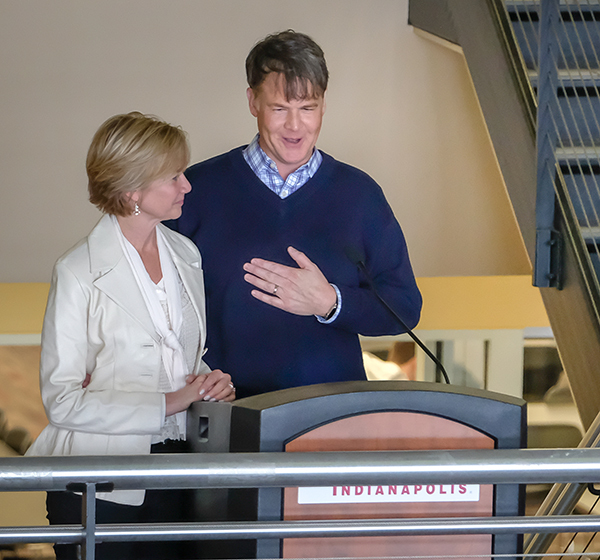 University Board of Trustees members Ed and Pamela Qualls, who met on campus as undergraduates in the 1980s, shared their story of how their experiences at the University of Indianapolis shaped their lives. Pam Qualls explained that she developed a lifelong commitment to education for service at the University. “We began to realize how formative this university had been for all of us and now with all of our experience in life, we see that’s not something that happens by accident. It’s something that is created. A culture where you learn how to use your gifts to enrich other people’s lives is rare and amazing,” she said. The work of students from the arts and engineering disciplines was on display during a recent dedication ceremony. The display also celebrated the heritage of Indiana Central College and the University of Indianapolis with vector-based images of the campus community at different points during the 20th century. Those maps, created by art & design students working with Randi Frye, assistant professor, will soon be on display in the Sease Wing and during heritage tours on campus. President Manuel presented the Qualls with the inaugural map representing 1986. “We hope it reminds you of this very special place that started your journey together and how you both have now impacted the University and our journey,” Manuel said. 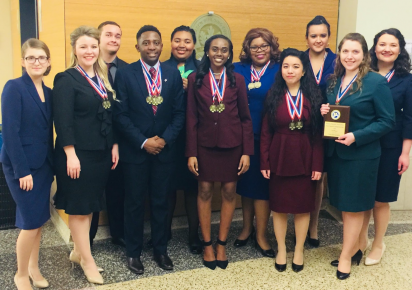 The University of Indianapolis Speech and Debate Team won big at the Indiana Forensics Association (IFA) State Championship in February 2018 at Ball State University. Three members of the team earned the honor of being named a state champion, and the team as a whole earned top honors throughout the tournament. The Greyhounds finished third in the overall team award sweepstakes category. The UIndy Speech and Debate Team is a nationally ranked community that competes in events to enhance student’s communication, research and public speaking skills. Stephanie Wideman, assistant professor of communication, is the team director. “Our success at the state competition is reflective of the student’s hard work and dedication to honing their personal skills as well as representing the university well,” Wideman said. See a full list of team results below. The team will travel to two national tournaments in March to finish out the competitive season. The University of Indianapolis Swimming & Diving office suite in the Ruth Lilly Center now has a new name: the Bryant Office Suite. The Bryant Office Suite was dedicated in honor of Thomas and Judy Bryant and their generous philanthropic support of the UIndy Swimming & Diving teams. The dedication took place after the Greyhounds wrapped up their regular season with victories—providing even more reasons to celebrate. Remarking on the impact of their generous gift, Vice President of Intercollegiate Athletics Sue Willey described it as an investment in a great product—the Swimming & Diving teams. “These student-athletes get it done in the classroom, off the diving board, in the pool and in our community. Our student-athletes continue to strive for excellence in everything they do,” Willey said. Tom Bryant has been a barber for 57 years, where he has cut hair for hundreds of faculty, staff and students over the years. Upon retiring, he sold his barbershop and adjoining property along Shelby Street to the University. This fall, he generously donated $100,000 to the University, dedicated specifically for the Swimming & Diving program. University President Robert Manuel described this moment as a time to commemorate the pipeline of generosity that has existed since the beginning of the University. It also illustrates the strong connections between the University in its surrounding community, which continues to embrace its mission and impact. “Celebrating this today is truly one of the greatest honors a University president can have. And I’m grateful to Tom for your generosity and your engagement with us in the long term,” Manuel added. For more than 35 years, Tom has been using the University’s pool to swim in the Master’s program. He credits the activity with enhancing and extending his life. Swimming & Diving Head Coach Jason Hite also thanked Tom for his continued partnership with the University and for being a great example to the University’s student-athletes. INDIANAPOLIS — The hub of the University of Indianapolis campus now has a new name: the Shreve Atrium in the Schwitzer Student Center. The naming of the atrium recognizes Jefferson and Mary Shreve for their generous gift to the University of Indianapolis. The Shreve Atrium provides space for students, as well as community members and community partners, to engage, interact and gather. Thousands of people pass through the gathering space daily. University President Robert Manuel called the new name a fitting tribute to a south side family that has made a commitment to giving back. 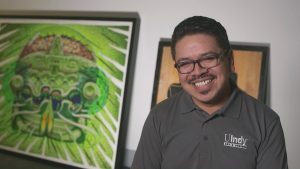 “(The naming) is a wonderful opportunity to be able to connect to the Shreves as they think about their philanthropy, engaging the community and facilitating the conversation as the University Heights neighborhood develops,” Manuel said. Jefferson and Mary Shreve are residents of the south side of Indianapolis, where Jefferson was born. He’s the founder of Storage Express, which has grown to include 93 self-storage facilities in five states, with dozens of locations in Indiana. Jefferson Shreve formerly represented the district that encompasses the University of Indianapolis on the Indianapolis City-County Council. Remarking on his family’s deep ties with the south side, Jefferson Shreve explained that he lives in the family home first purchased by his grandparents in 1960. He called the University of Indianapolis the anchor of the University Heights neighborhood. “I’ve been so proud to be associated with UIndy and through the time of Rob’s leadership and focusing on making this the anchor and not the island on the south side. 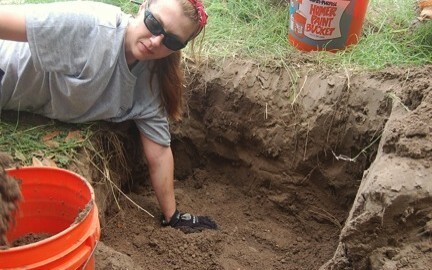 It makes such a difference,” Shreve said. “I am so thankful and grateful to have our name associated with this campus and with this space, which is particularly meaningful to us, because this space is that connecting point not just for the student and faculty life but also for the community that reaches its fingers through the south side,” Shreve added. Former Indianapolis Mayor and Visiting Fellow Greg Ballard thanked Jefferson Shreve for his continued service to the city and to the University and dubbed him one of the city’s unsung heroes. “Now we’re able to celebrate what he’s been doing. That doesn’t mean his compassion, generosity and his charitable nature has not been going on for decades already,” said Ballard, visiting fellow with the University’s Institute for Civic Leadership and Mayoral Archives. Visual communication design graduate Daniel Del Real ’05 offered his creative talents for this year’s University of Indianapolis holiday card. Good Hall was an easy subject choice for Del Real—it’s where he held his first public art show during his senior year and he attended classes there every semester as a student as well. While designing the card, Del Real built a scale model of Good Hall and adorned the building with miniature holiday decorations, ribbons on the columns and artificial snow. He even provided lighting on the inside of the model. He said he drew his inspiration from a card he received from a friend depicting a Christmas village. Once the model was finished, he photographed it for the University’s holiday card. Del Real explained his biggest challenge was getting the proportions right. To do this, he said he measured the windows on several images provided by the University to assign a scale for each detail of the building, including the bricks, molding, columns and steps. Watch this short video to hear about his creative process. The scale model of Good Hall will be on display at the Krannert Memorial Library following the holiday break. Del Real is the resident artist at the International Marketplace Coalition, working to forge relationships between businesses, community and artists through public art programs and installations that enrich the International Marketplace neighborhood on Indy’s northwest side. He received the University’s Distinguished Young Alumni Award at the Honors & Recognition Dinner in September. He also partnered with current students to create greyhound vignettes that were on display at that Homecoming event. Latham’s work has brought national attention to the humanitarian crisis happening at the U.S. southern border. A unique new book by University of Indianapolis faculty sheds light on the migrant death crisis in the Texas Borderlands by discussing the circumstances that force people to flee their home countries to seek refuge in the United States – despite the perilous journey. The book also explores the reasons why migrant deaths have reached mass disaster proportions and the techniques employed by forensic scientists to locate and identify the dead. “Sociopolitics of Migrant Death and Repatriation: Perspectives from Forensic Science” by Krista Latham, associate professor of biology and anthropology, and Alyson O’Daniel, assistant professor of anthropology, explores the migrant death crisis at the U.S. southern border, along with the forensic techniques utilized in this humanitarian crisis. The book focuses on situating the migrant death crisis and response within a broader sociopolitical framework by highlighting the challenges faced by forensic scientists working in this context and the techniques used by cultural anthropologists to contextualize the crisis. “Sociopolitics of Migrant Death and Repatriation” includes chapters written by experts actively working on these issues and discusses how historically-driven conditions of social inequality, resource allocation and policy implementation have contributed to the crisis unfolding along the border today. Latham and O’Daniel organized a symposium based on the book at the 37th Annual Mountain, Desert & Coastal Forensic Anthropologists Meeting in 2017, where the work of ten of the contributing authors was presented and discussed. “The main focus of the book is to better understand the crisis and the forensic science response as shaped and constrained by broad, systems-level processes of power,” said Latham, who also serves as the director of the University of Indianapolis Human Identification Center. “Sociopolitics of Migrant Death and Repatriation” introduces readers to some of the forensic science techniques utilized in the migrant identifications, including forensic archaeology to recover the bodies and DNA analysis as a means of positive identification, among other techniques. “Our authors together have traced how global and local political economic relationships shape what happens to marginalized migrants in life and in death. The picture that emerges is profoundly troubling, but it is not without hope and not without dedicated individuals who are indeed taking action,” O’Daniel said. In restoring the names and memories of migrants whose identities would otherwise be unknown, Latham said the goal is to create a record that one day will work toward change and social justice. Follow Latham’s work in Texas here. The proposed changes to our tax codes being considered by the U.S. Congress will negatively impact our regional economic competitiveness by limiting the ability for Hoosiers to earn a college degree. As for our tax code, clearly it is time to think about better ways to manage how and why we tax. But, in the case of the current tax changes under consideration, the sweeping impact to higher education will have a devastating effect to our communities in the long term. Higher education serves as as catalyst for positive change in workforce development, economic revitalization and bolstering our quality of life. The more people earning a college degree or credential, the more competitive our region becomes in attracting businesses, creating new ones, filling workforce needs, and supporting an informed citizenry. At a time when our country should be making higher education more accessible and affordable, these changes threaten many benefits that fundamentally impact the ability of students to attend college. The proposal, up for a vote by the U.S. Senate as early as Friday, will cost institutions, parents, and students an additional $65 billion over the next 10 years, according to the American Council on Education. The impact of the proposed changes on higher education will make it more costly for universities to access debt to improve learning facilities, provide funding opportunities for students and create environments of innovation. More than 12 million people benefit from student loan interest deductions each year, which the proposed legislation would eliminate. This is money that not only helps students and families pay for college but also allows for more investment to support a strong economy. Students who receive tuition waivers now face the prospect of those funds being considered as taxable income. The proposal also would tax endowments at institutions across the country that support student success. In addition, tuition reimbursement programs–a valuable tool for attracting talent and helping university employees afford college for themselves and their children–also soon could be considered taxable income. The proposed changes ultimately will have the effect of adding to the growing $1.4 trillion in student debt that continues to weigh heavily on college graduates today. They also will have a chilling effect on enrollments, which will create a long-term decline in our state’s talent base for the future. The University of Indianapolis has a proud tradition of welcoming first-generation college students (about 40 percent of total enrollment each year). 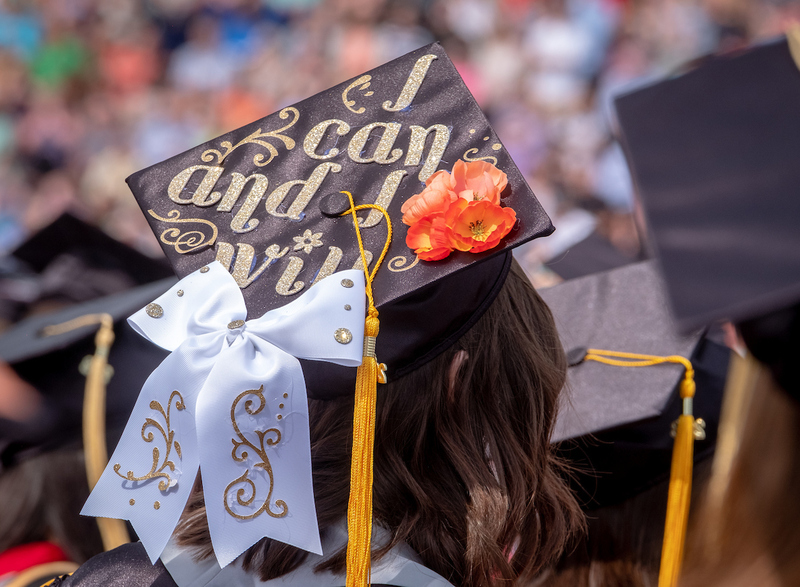 More than 86 percent of our alumni choose to live in Indiana, and our University offers more than $48 million dollars of its own money to help talented students earn a college degree. All of the other institutions of higher education in our state provide similar benefits to the region. The proposal before Congress also will have consequences for our regional economic development well into the future. Indiana has a long-standing commitment to bolstering the intellectual capital in our state. We are recognized as a state that incubates technological innovations, attracts new business, and provides one of the most enviable standards of living in the country. These proposed changes will increase the chances that we will lose our economic momentum and slow the advances we have made in preparing a 21st Century workforce. These are the core engines of success in Indiana, and any future changes to the tax code should be mindful of the important role higher education plays in safeguarding them. When Payton Revolt graduated from the University of Indianapolis in 2013 with a degree in psychology, she knew she wanted to move into a career that would allow her to help people. But she also realized that she wanted to make an impact on whole populations, not just one person at a time. Enter the UIndy Master of Public Health (MPH) program, which Revolt began in 2015. Fast forward two years when Revolt graduated from UIndy a second time with her MPH. She now has a job as a vaccine-preventable disease public health investigator at the Indiana State Department of Health. 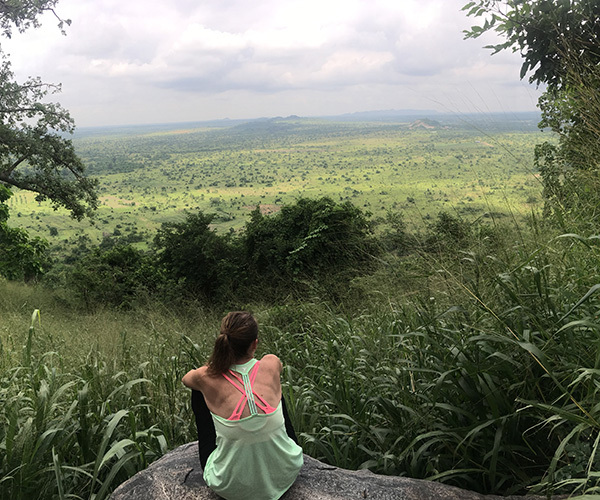 One of Revolt’s most significant experiences as an MPH student came in the form of an internship in Dodowa, Ghana on the continent of Africa. Revolt spent six weeks in Dodawa during the summer of 2017. 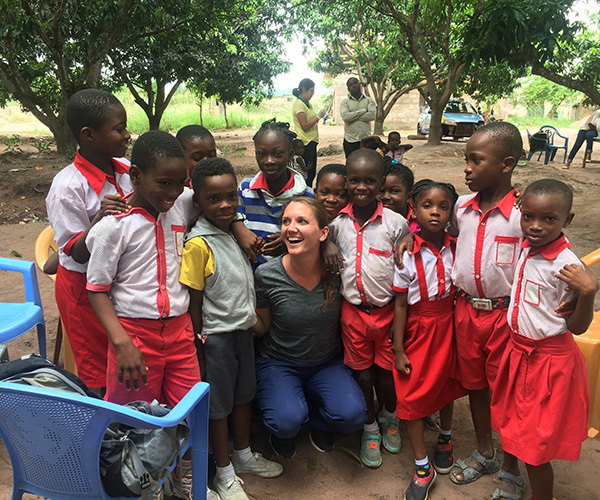 Working with an organization called Projects Abroad, she was responsible for implementing a program that provides free, same-day testing and treatment for malaria to school-age children. The malaria test consists of a simple finger prick and 15 minute rapid screen. 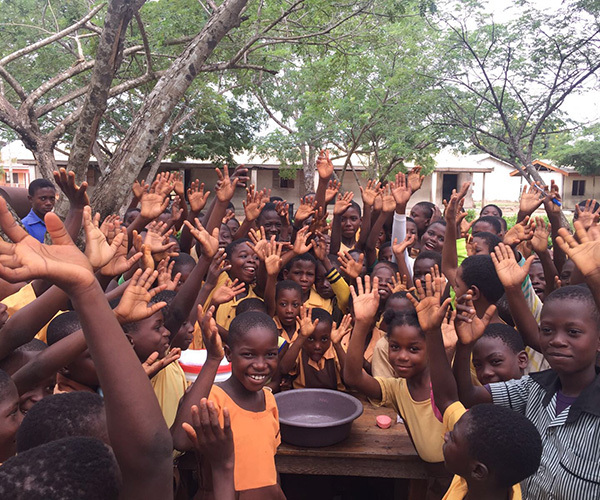 Children who tested positive for malaria were given educational materials and antibiotics to take home with them. “Students in Dodowa are very responsible and receptive,” said Revolt, who was confident the information made it home to parents. 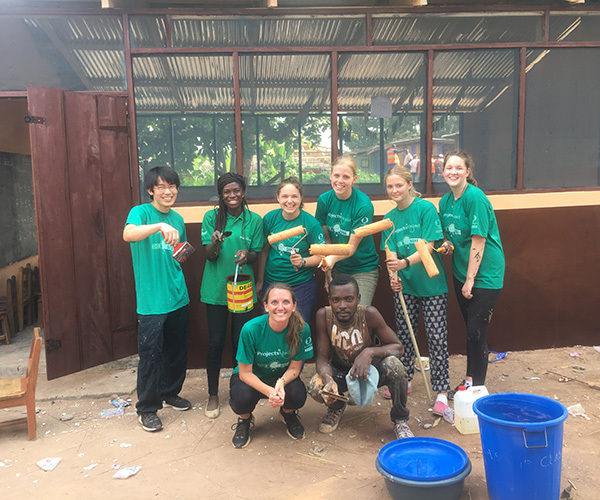 In addition to testing for and treating malaria, Revolt and Projects Abroad provided Hepatitis B testing and education for teachers and ringworm and wound care education and treatment to students and teachers. In order to avoid contracting malaria herself, Revolt took a daily pill called malarone, slept under a mosquito net, and used bug spray. She said that just living and working in a third world country was an education. 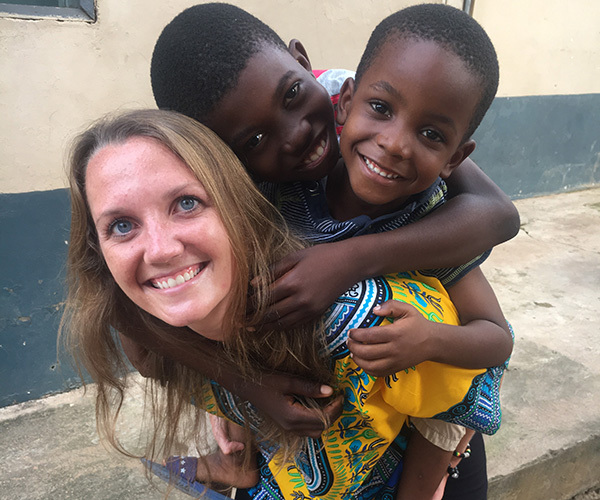 As a public health investigator for ISDH, Revolt’s day-to-day life in the United States is certainly different than her days in Ghana. Currently, she participates in and disseminates information about disease outbreak investigations across the state. She also conducts special studies, routine surveillance, and analyses of health outcomes data. Her job responsibilities include coordination with local health departments, hospitals, and other partners to ensure timely reporting of vaccine-preventable diseases and appropriate specimen collection for analysis. In the future, Revolt hopes to study whether there is any link between health disparities and vaccine-preventable infectious diseases. 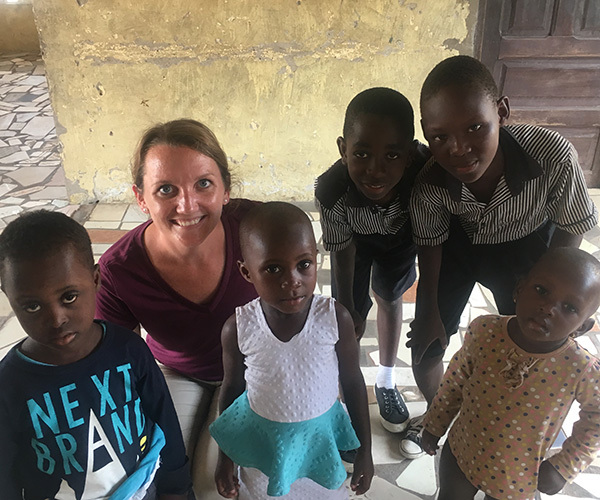 While she is getting used to and enjoying to her new role at ISDH, Revolt hopes to one day work again in a global health effort, even if only in a volunteer capacity. Written by Amy Magan, Communications Manager, Center for Aging & Community, University of Indianapolis College of Health Sciences. 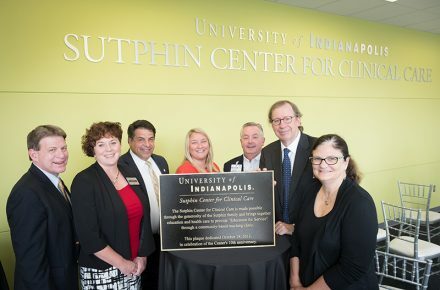 The Sutphin family legacy at the University of Indianapolis ushered in a new chapter with the dedication of the Sutphin Center for Clinical Care in the UIndy Health Pavilion in August 2017. The Center commemorates Dudley and Mary Louise Sutphin and strengthens the University of Indianapolis’ commitment to building partnerships that create better health outcomes for underserved populations. The Center brings together critical services within the UIndy Health Pavilion, including physical therapy, medical and behavioral health clinics. The Center, originally located in Fountain Square, will continue the University’s work to combine improved access to health care with advancement of education initiatives in the health professions. “The Sutphin Center for Clinical Care provides an important place for our students, faculty, and community members to come together. We can extend our applied clinic teaching experiences, and offer support to enhance the health and wellness of our community at the same time,” said University of Indianapolis President Robert L. Manuel. By serving multifaceted needs through services such as rehabilitation, health and wellness and mental health, Manuel praised the interprofessional culture that serves as the backbone of the Sutphin Center’s philosophy. Students have the opportunity to work alongside Community Health Network clinicians and to collaborate with students in other health disciplines. “As educators, we know students learn best in real-life environments, so the addition of the Sutphin Center in space just downstairs from classroom learning is a valuable resource for the UIndy health professions. Students will have opportunities for internships, focused learning activities, interprofessional learning and research that is right at their doorstep,” said Stephanie Kelly, dean of the College of Health Sciences. Vice President for University Advancement Chris Molloy noted the longstanding relationship between the Sutphins and the University. “The Sutphin family has been a longtime supporter of the University of Indianapolis in its mission to reach out to the community, and the Center positions the University to continue to make a positive impact,” said Molloy. The Sutphin family has a long history of supporting the University of Indianapolis beginning with the establishment of the Sutphin Lectures in the Humanities, endowed in memory of Samuel B. Sutphin by his sons Dudley V. and Samuel Reid Sutphin. Charlie Sutphin, who is Dudley’s son and Samuel’s grandson, continues to support both the Sutphin Lectures and the Sutphin Center for Clinical Care. At a recent dedication ceremony, Charlie Sutphin noted the strong ties between his family and the University. He shared the story of his father receiving an honorary degree in 1992. “I saw how much that meant to him, and it sustained my ongoing interest in the University of Indianapolis,” Sutphin said. Sutphin encouraged students to get involved in volunteer or outreach opportunities, noting the value of community connections. “We should all strive to belong to a group that is greater than ourselves,” Sutphin said. 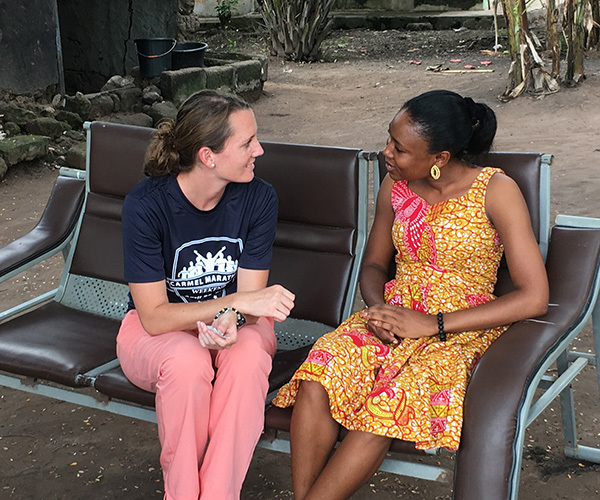 While many doctors enjoy the resources of large clinics or hospitals, Dr. Katherine Welch, ‘93, delivers medical care in some of the most remote areas of the world, sometimes with few of the amenities typical for physicians today. Welch is the founder of Relentless, a Thailand-based global consulting agency that trains organizations to assist populations that oftentimes are victims of abuse, exploitation and trafficking and have no access to medical services. She is a global leader in the fight against human trafficking, a scenario she never imagined as a chemistry student at the University of Indianapolis.